"My experience with Jayme was nothing short of fantastic. I came to know her as a nurse and followed her on social media becoming interested and amazed in her own fitness journey. Being a practicing Cardiology PA, I was well aware of the "do's and don't's" and did my best to adhere to such. I was of the old adage calories in/calories out but despite doing such was failing to see/achieve the desired results. I enrolled in a 6-month dietary online coaching program. She was outstanding, especially helping me see that it is a "must" to refrain cutting one's caloric intake which thus leads to slowing down the body's metabolism! Her recipies were delicious and easy to prepare. I highly recommend Jayme to assist in achieving anyone's fitness goals!" Hannah is a new mom who came to me after the birth of her first baby. She needed to gain the confidence to rock her new mom bod as well as the knowledge needed to properly fuel her body. Within 12 weeks of using my Customized Training Program, she lost a total of over 9 lbs and 8.25"! Hannah had this to say: "This program has genuinely changed my life. When I started this journey, I was a new mommy and 6 months postpartum with little to no confidence. I needed a lifestyle change to shake up the way I treated my body! I needed to learn the fundamentals of taking care of my body through nutrition and exercise. Jayme's program has taught me that and so much more. I still have a ways to go but I am well on my way with her help! Thank you, Jayme, for everything!" Colleen is a full-time working mom of two. She found me on Instagram, and contacted me wanting to start a weight lifting regimen after spending hours on the treadmill and not seeing any changes in her body. Through the Hot Mama's Nutrition Guide, she learned how to properly fuel her body through the right amount of calories and macros (and that even meant eating carbs---gasp!). 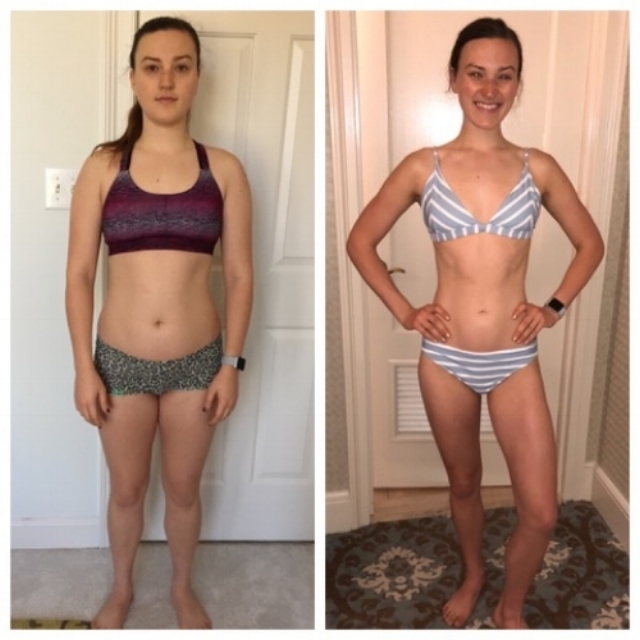 A few weeks after eating a clean, balanced diet and lifting weights, she started to notice a HUGE difference--not only in her body, but in her energy level as well. Twelve weeks later, she is down 9 1/2 pounds, over 16 inches, and 4 pant sizes. She is like a totally different person, and I am SO proud of her hard work and dedication to making this a LIFESTYLE change! "After having our second child, I knew that I didn't want to wait too long before jumping back onto the fitness bandwagon. I started out with Jayme's "Home Based" training program and then moved to the "Lean Machine" guide once I joined a gym several months later. I absolutely LOVE that Jayme puts descriptions and pictures of the individual exercises in guides so there's no guessing or room for error! I have never in my life felt as confident as I do now, after having two kids, and I never thought I would be able to say that. Because of Jayme's coaching, eating clean and working out is now a LIFESTYLE for me. I will forever be grateful to her for that!" "At the beginning of my journey to a healthier lifestyle and a better me, I really struggled with my diet. Coming from a small southern town where everything is deep-fried and drenched in sugar, I really was ignorant to what kinds of foods were actually holding me back from my goals and from feeling my best. I began to follow Jayme on Facebook/Instagram and was immediately interested in her "clean eating" and how it could help me. I didn't contact her right away, simply because I knew this would be a big change for me. But when the "baby belly" wasn't quite leaving despite working my tush off in my workouts, I KNEW I had to change my eating habits. I finally pulled the trigger and reached out to Jayme for advice. She has provided me with so much insight and has educated me in the area of nutrition. I was no longer ignorant to what I should be eating. Jayme provided realistic goals and ideas for not just myself, but for my entire family's way of eating. We absolutely LOVE her crockpot chicken! Her recipes are simple and easy to follow for busy, on-the-go mamas, which is a huge win for me. The one thing that stands out to me about Jayme is that she is encouraging every step of the way. If I "fall off the wagon", I know she will be there to push me to do better tomorrow! No judgement, just encouragement. her excitement and passion to see others live healthier makes it so easy to work with and learn from her. Thank you so much, Jayme! Because of YOU, I have reached my nutritional goals and my whole family feels better!" Heather is also a mother of two (notice a trend here?) and a full-time RN. She decided to change her life after the birth of her second son, and became a BeachBody Coach. After hitting a plateau, she joined my group of Hot Mamas so that she could continue to change her body through a clean diet/strength training. During this process, she learned how to deal with her emotional eating issues, which really helped to break through that pesky plateau! After 12 weeks of really monitoring her diet and pushing through those workouts, Heather lost 7 pounds and over 10 inches! She also gained some knowledge that she can pass down to her boys to help them live happy and healthy lives! I'm so proud of you, Heather!